Day Early Learning is a program of Early Learning Indiana. We’re dedicated to providing the highest-quality early care and education for children from infancy to pre-K in 10 Indianapolis area centers. Our goal is to provide high-quality, accredited early childhood care and education at a price all families can afford. Have questions? Check out our list of common questions. If you don’t see the answer to your question, let us know. As a program of Early Learning Indiana, careers are posted at earlylearningin.org/careers. From tips and tricks for parents with toddlers to stories from the classrooms, our blog keeps you up to date with the latest from our centers and beyond. Like us on Facebook, or follow us on Instagram and Twitter. You can contact a specific center by choosing your “Preferred Center” on the general contact form. Day Early Learning is a program of Early Learning Indiana. 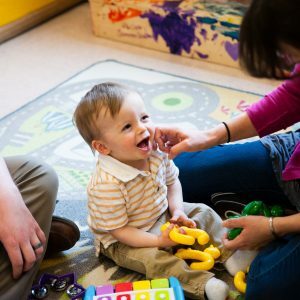 We’re dedicated to providing the highest-quality early care and education for your child from infancy to pre-K in 9 Indianapolis area centers. Day Early Learning centers are unlike other child care agencies in Indianapolis in a number of ways! We’re motivated by mission rather than money. We care about your child, and it shows in the quality of the care and education we provide. With more than 100 years of history, we’ve proven ourselves as a top provider of high-quality child care and education. We have a bigger mission. Not only do we provide excellent learning experiences in our centers, as part of Early Learning Indiana we champion high-quality care for all Hoosier children. Our sister programs, Child Care Answers and Partnerships for Early Learners, increase quality and expand access to early education throughout Indiana. Your child will learn in a rich, diverse environment that nurtures individual talents and addresses the unique backgrounds of each child we educate. Outcomes matter for your child. Nearly all of our centers have achieved Level 4 on Indiana’s Paths to QUALITY ratings scale and are nationally accredited. At Day Early Learning, we take a holistic approach to your child’s care and education. Everything we do is aimed at nurturing each child’s social, emotional and educational needs. Our ultimate goal is not only to prepare your child for kindergarten, but also to inspire a lifelong learning journey. And that’s exactly what learning is at our centers—a journey. Your child will be an active participant in their education, spending time both in enriching classrooms and outdoors exploring the world. 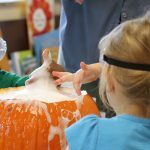 Each Day Early learning student gains knowledge through hands-on experiences that spark playful curiosity and meaningful growth. We will ensure that your child learns at a level that is appropriate for his or her age and development. Each classroom is staffed with a lead teacher, a teaching assistant and a staff-to-child ratio that ensures a great deal of one-on-one attention. Well-educated and trained teachers ensure that your child will be in the best hands possible. Our staff benefit from ongoing professional development, support for additional degree attainment and classroom coaching. And our curriculum is aligned with the early childhood Foundations laid out by the Indiana Department of Education. Each week, you will receive written observations of your child’s development on LifeCubby. These observations are used to help teachers create meaningful lesson plans that will ignite curiosity in your child and help us monitor your child’s growth and learning on a daily basis. When parents enroll in our program and each time your child transitions to a new classroom, teachers and parents complete the Ages and Stages Questionnaire (ASQ). This tool allows us to help you track your child’s progress in language, problem solving, fine and gross motor, and social-emotional development. It also helps us ensure the right materials and supports are being used to help your child reach the next stage of their development. 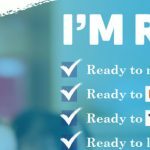 In the fall, winter, and spring our teachers complete an overall assessment on your child’s progress using a tool from the Indiana Department of Education called ISTAR-KR (KR=kindergarten readiness). This assessment is aligned to the Indiana kindergarten standards in the areas of English/Language Arts and Mathematics. In addition to measuring children’s growth, our learning environments and teaching staff are regularly assessed using classroom observation tools to ensure the highest level of teacher-child interactions. This is important because high-quality environments and teacher-child interactions encourage and promote children’s language, math, vocabulary and social skills. Day Early Learning programs have a strong track record of preparing children for kindergarten, as well as success in life. Children are more competent socially and emotionally, and show better verbal skills as well as intellectual and physical development. Our children come away with invaluable learning experiences and problem-solving skills that that spark their curiosity and instill a spirit of inquiry throughout the rest of their lives. The Day Early Learning leadership team and early education experts ensure the highest quality early care and education to children at our centers. With a background in organizational strategy and execution, Maureen Weber has spent her career working across multiple sectors – with an emphasis on human capital development and education – to improve the way that organizations meet the needs of the individuals they serve. Having more than two decades of international experience as a teacher, mentor, cognitive coach, director and center owner Jane shares a breadth of early childhood experience with our directors, teachers and students. She has a M.Ed. and Ed. S in early childhood education and specializes in teacher support and curriculum development. Christine leads the Early Head Start team in providing technical assistance, ensuring the highest quality and best practices for our littlest learners. 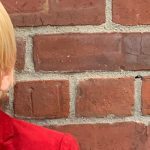 She brings 20 years of experience in the field of early education, with an associate degree in early childhood education and bachelor’s degree in developmental psychology from Purdue University. All Day Early Learning jobs are posted and managed by Early Learning Indiana. This button will redirect you to the EarlyLearningIndiana website careers section. For more than 100 years, Day Early Learning was known as Day Nursery. Under that name, we spent more than a century building a reputation as Central Indiana’s standard-bearer for excellent child care.  In 2014, Day Nursery changed its name to Early Learning Indiana, and our early childhood centers became known as Day Early Learning centers. At Early Learning Indiana, our goal is to continue our tradition of being the area’s best source for child care services and resources, while embracing a larger role as an advocate and leading voice for early childhood education in Indiana. Our mission every day is to ensure the highest quality early care and education for children in Indiana. Learn more about Early Learning Indiana. Day Early Learning is a program of Early Learning Indiana. We’re dedicated to providing the highest quality early care and education for children from infancy to pre-K in 10 Indianapolis area centers.